Raymond Weil is one of the best premium Swiss watch brands that are appraised globally for their crafty mechanisms and uncomplicated designs. The trademark radiates an exclusive personality of its own, which has made it one of the most prestigious luxury watch brands with global recognition. Besides its good look, the brand offers a rich history of its own that has added an aura of authenticity into all its products. The watch manufacturing unit of Raymond Weil was established in 1976 in the city of Geneva in Switzerland. The founder of this company was Raymond Weil, and he administered the business from 1926 to 2014 and established the trademark as a sign of quality. Presently, the business is managed by three family members: Olivier Bernheim, (son-in-law of Mr. Raymond Weil), and Elie and Pierre Bernheim, two grandsons of late Mr. Weil. The business is still running under complete family control, but as a part of inheritance, it has never compromised quality, authenticity, and up-gradation in technology applied for making luxury watches. Art and music were always imperative and inspirational for the Raymond Weil watch manufacturing company. For example, its Amadeus range was inspired by Milo Forman's film ‘Amadeus’. The next luxury watch range is Fidelio, and the name of the collection was inspired by the musical “Only Opera” composed by a famous music genius Beethoven. The Othello range was a signature watch collection by Raymond Weil brand with a special character of its own – designs with interesting and innovative shapes of the dial, etc. deserve special mention. 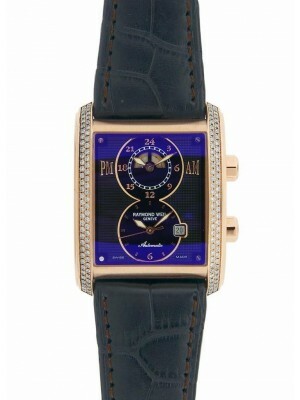 Other coveted ranges from Raymond Weil are Shine, Parsifal, Noemia, etc. The legacy of making awesome Raymond Weil luxury watches is still on. New designs are added every year and the trademark has earned huge applause from its premium patrons scattered all over the globe. The luxury watch brand has introduced several elite watch collections in the global market and every new collection of watches is made exclusive with extraordinary details. Raymond Weil Allegro Watches: The elegant style of Raymond Weil Allegro range displays its typical characteristics of light weight, effortlessness, and smoothness of its quality. The Allegro name is perhaps inspired by Amadeus Mozart’s noted musical works. Raymond Weil Nabucco Watches: Nabucco stands for the short form of a historic character, king Nabuchodonosor. His gallant life and pathetic exile is the theme of this wristwatch range, which was introduced in 2007. The robust feature of the watches resembles the powerful king’s boldness and majesty. Raymond Weil Othello Watches are marked for their designs that ignite passion, love, and macho heroism adding them a masculine flavor. These are supposed to be bought by men with a distinct character of their own. Besides new watches, Raymond Weil luxury used watches are also in huge demand in the consumer market. This is only a glimpse of the exclusive Raymond Weil world of luxury watches. You should always purchase these luxury used watches from authentic online portals like Midtown Watch.